Exporter of a wide range of products which include braided wires. 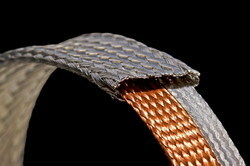 We have established as the leading manufacturer, exporter and supplier of Braided Wires. Our offered wires are fully packed with technically-advanced features so as to enhance its durability. This range is manufactured under the strict vigilance of our experienced professionals using high-grade copper and high-end technology. In order to ensure their high tensile strength, we test the entire range on various parameters. This range can be availed from us in various technical specifications. Looking for Braided Wires ?